What Is Va Form 21-526 Series? 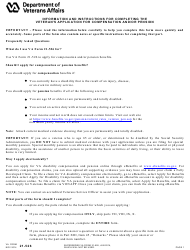 VA Form 21-526EZ, Application for Disability Compensation and Related Compensation Benefits. Report an injury or disability as soon as possible to avoid delays in receiving the benefits. A list of all injuries and illnesses for which the disability compensation is requested is a necessary part of the application. Medical records supporting the claim should also be submitted along with the application. To apply in person, visit a local VA office. Application through the Veterans On-line Application (VONAPP) website is no longer available. Applications filed through the VONAPP will still be processed and the VA will contact the applicant for further information. VA disability compensation is a monthly tax-free payment to veterans who received a disability as a result of an injury or an illness while being employed in the military service. A veteran or a service member may be qualified for VA disability benefits for physical conditions, such as a chronic illness or injury and mental health conditions, such as PTSD that developed before, during, or after service. The disability albeit did not appear until after the service is nevertheless related to the active-duty service. This is called a post-service disability claim. Also, if you have a disability that has been diagnosed by a doctor and it can be linked to your military service because of a specific aspect of that service, you may be eligible for disability benefits based on this presumed disability. 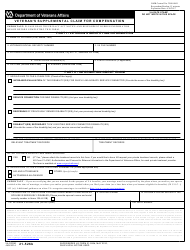 This is a multi-purpose form used for providing information to the Department of Veteran Affairs (VA). 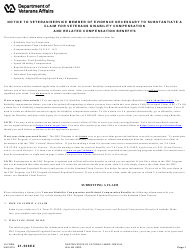 It is used in conjunction with other claim forms.